As the traveling circus rolls into Hilton Head again this week, we’re likely to receive our annual booster shot of the conventional wisdom surrounding Harbour Town’s status as one of the best courses on tour. (This position was reinforced by a recent Golf World players’ poll, in which the course came in second only to Augusta National as the pros’ favorite stop of the year.) 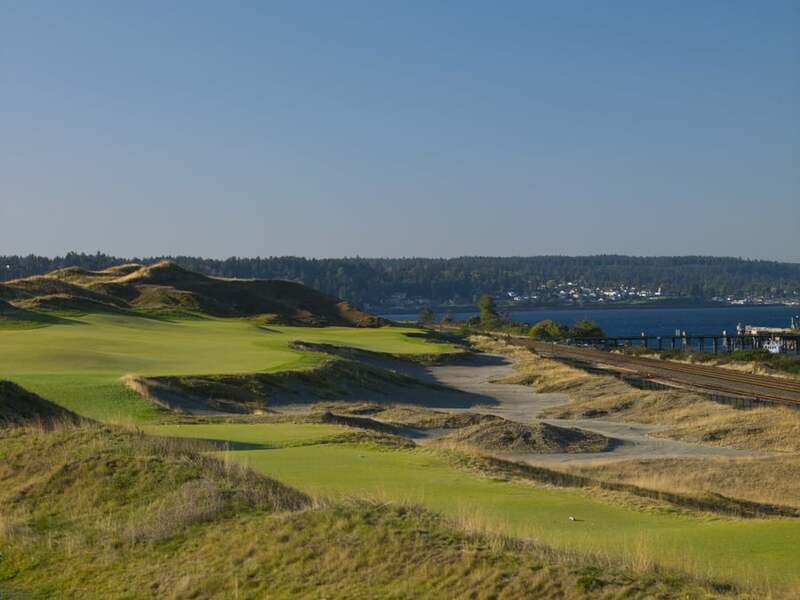 We’ll hear it described as “a shotmaker’s course,” one that doesn’t favor any one type of player—finding champions among bombers (Davis Love III, five times) and technicians (Justin Leonard, Jim Furyk) alike. We’re less likely to hear about how Harbour Town represents the Dylan-goes-electric moment in the history of golf course design, but that’s true as well. Back in the late ’60s, Pete Dye, the story goes, watched Robert Trent Jones, Sr.—the dominant designer of the post-war period—building his namesake course at Palmetto Dunes up the road and decided to do literally everything differently. Greens the size of pool tables. Vicious little pot bunkers with railroad tie sleepers. Tight playing corridors. Waste areas in place of traditional rough. These things don’t seem all that unusual today, in part because Dye went on to spend nearly the next half-century elaborating on this style, but in its time Harbour Town was a thoroughly original piece of work. However, the spirit behind Harbour Town is reactionary, and not in an altogether positive way. C.B. Macdonald’s architecture at the National Golf Links was reactionary, as well, but he sought to improve upon the great holes of the British Isles, while Dye set out to torch the RTJ playbook and build something lean and mean. There’s a world of difference in there, and the proof is in the playing. 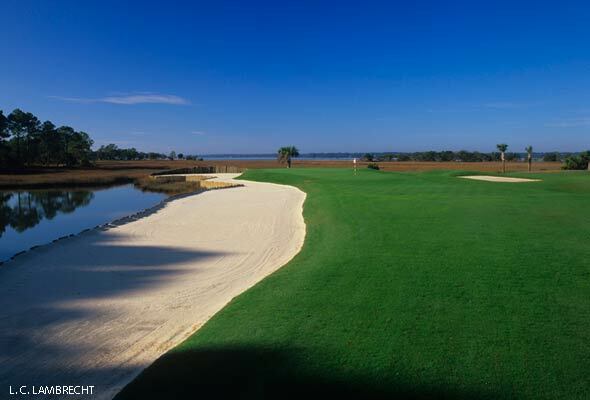 Ask yourself this: Would “fun” be among the first adjectives you’d use to describe Harbour Town? Not to this observer. This isn’t meant as a value judgment—Dye’s modus operandi with most of his designs is to take golfers out of their comfort zones, using all kinds of stratagems to ratchet up the intimidation level. They weren’t necessarily designed to be “fun,” though of course many golfers enjoy the thrills and stark do-or-die challenges that they offer. Here’s the larger, more important question, though: Is Harbour Town a great strategic golf course? I would argue it is not, because despite the creativity of Dye’s greens and hazards, the course is a tactical nightmare. It acquired a reputation as a shotmaker’s course, but in defining it in opposition to the “7,200-yard championship designs” of the Trent Jones era, it’s possible that problematic or imprecise language was used. The issue is that at Harbour Town, the nature of those shots are frequently dictated to the player, and that far too often the demand is to hit it dead straight, or else. Does a true shotmaker’s course limit the player’s options? Sure, in the course of every round the player will probably have to manufacture at least a couple of wild, thirty-yard hooks or slices around trees. That’s shotmaking, all right, but it’s of the forced variety rather than the imaginative. At Harbour Town, if you’re the type of golfer that really likes to work the ball, you can find yourself feeling out of position on the tee. In light of the show he put on at the Masters last weekend, it’s worth pointing out that Bubba Watson has played the Heritage exactly once in his career, back in 2007, and missed the cut. Granted, one player does not an argument make, but surely it says something about this renowned shotmaker’s course that one of golf’s most brilliant shotmakers avoids it like three-day-old fish? Pete Dye returned to Hilton Head last summer for a course review. Most of his work involved adding length. Tee boxes were extended on eight holes, and this year’s Heritage will be played at 7,101 yards, thus further tipping the scales toward straight-shooting bombers in the Greg Norman/DLIII mold. Dye also added a handful of bunkers, mostly to protect a couple of par fives (the 2nd and 5th) that the pros were beginning to attack with impunity. Tree work during that visit was modest. They have always been a part of Dye’s design intent at Harbour Town, so it can feel a bit heretical to suggest that a course of such long-standing repute break out the chainsaws. But it’s hard not to wonder if the course wouldn’t be improved by allowing players a few more choices in their shot selection. 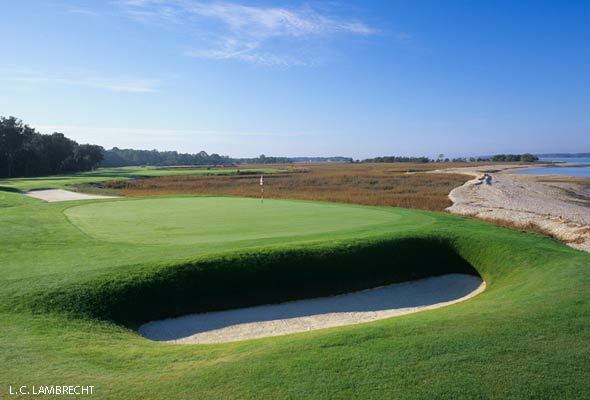 It’s more than a little ironic that the course’s most famous holes, the wonderful 17th and iconic 18th*, are out in the open, exposed to the wind and the glittering waters of Calibogue Sound—they have so little in common with the rest of the course. So what’s Harbour Town’s true identity? 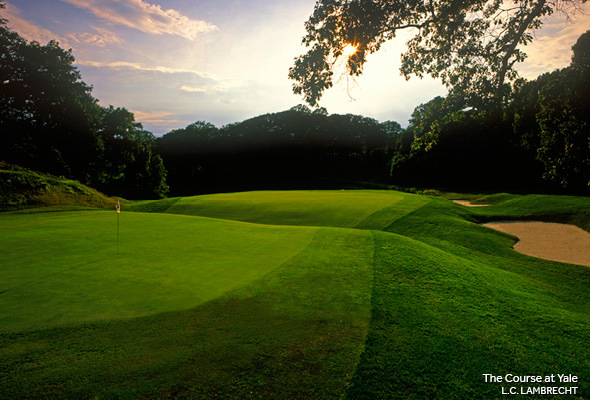 The late, great Furman Bisher once described the course as “purgatory with eighteen holes,” and that is just so apt. Harbour Town may be a great golf course, but playing it is far from heaven. *Technically, the approach to No. 16 should be grouped with the finishers, but the palmetto smack in the middle of the right greenside bunker presents a vile double-hazard and disqualifies the hole from traveling with 17 and 18 all on its own. One reason the pros love Harbour Town Golf Links so much is because with its cozy confines the course is so different from most of the other brutes they play on tour. But another reason why they like it so much, no doubt, is the locale itself and the relaxed atmosphere they find on Hilton Head, especially for those who just came from major cauldron in Augusta. 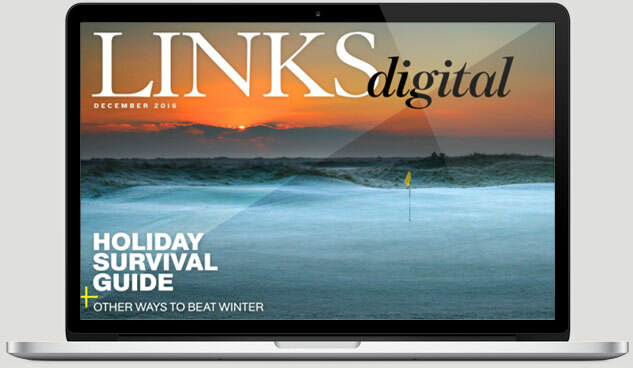 We at LINKS are lucky enough to call the island home. Our office is located just a mile or so from the Sea Pines front gate on the south end or “toe” of the foot-shaped, 12-square-mile island. The south end is also where most tourists like to stay and play (the “ankle” or north end is where most residents live). With miles of bike paths, cycling is very popular and a great way to get around. Ride to Coligny Beach for a swim in the ocean, a drink at the Tiki Hut at the newly remodeled Beach House hotel, and shop and dine in Coligny Plaza. The plaza is a little tacky and dated, but its funkiness is part of its charm. For better shopping, visit the two Tanger Outlets off island, one of which just reopened after a big remodel. The best parts of the area are found outdoors, however, particularly on the water. Harbour Town and Shelter Cove, located mid-island across from Palmetto Dunes, have numerous outfits to accommodate any aquatic request (go to HiltonHeadIsland.org for more info).